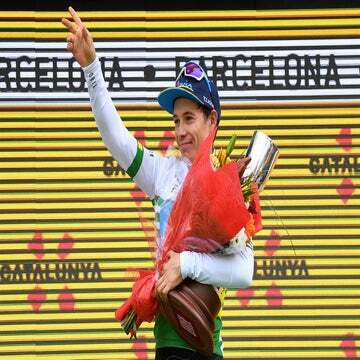 Nacer Bouhanni sprinted to victory and the race's first leader's jersey in stage 1 of Volta a Catalunya. After a frustrating near-miss at Milano-Sanremo on Saturday, Nacer Bouhanni stormed to a stage 1 win Monday at Volta a Catalunya. The Cofidis rider will wear the race’s first leader’s jersey after timing his sprint perfectly in a fast run to the finish in Calella, Spain after 175.8km of racing over five categorized climbs. 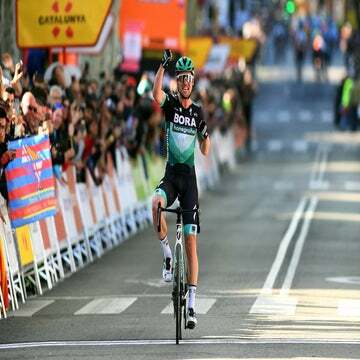 Sky’s Ben Swift was second, reprising his Sanremo result, while Orica’s Daryl Impey was third. The day’s breakaway was brought back on the final climb, Alt de Colisacreu, a Cat. 3 hill about 18km from the finish. Sky took over at the front and kept the pace through the twisting descent and on the flat roads into the finish. As the peloton swelled in the final 10 kilometers, Wanty – Groupe Gobert’s Bjorn Thurau took a flyer. He was soon caught, and Sky’s Nicolas Roche made a counter-move. With three kilometers to go, Roche had a gap of about 12 seconds, but the peloton quickly organized for the sprint and brought back the escape inside of the final two kilometers. Tinkoff led the field into the final kilometer and then Katusha took over. Orica moved up the left side and started the sprint, but Bouhanni, patiently waiting in the middle, burst clear on the long, gradual descent to the line to win. On Tuesday, the peloton faces a much flatter stage from Mataró to Olot, 178.7km with one categorized climb.